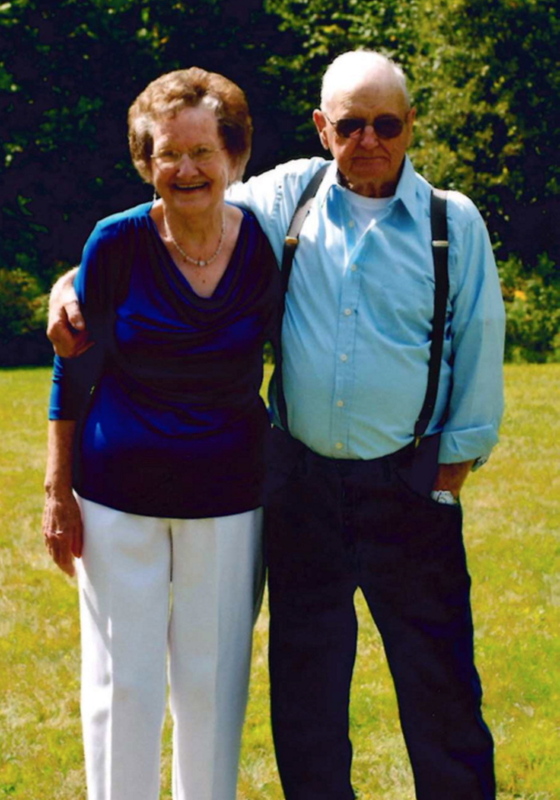 SMITHFIELD — Mr. and Mrs. Gerald Bulmer recently celebrated their 65th wedding anniversary at their home on Mt. Tom Road. Bulmer and the former Beverly Smith were married on Aug. 26, 1949, in Skowhegan, in a ceremony performed by Lowell Haynes. Mrs. Bulmer was employed by Norwock Shoe, Medway Shoe, New England Telephone Co., an ice cream shop, and retired from New Balance Shoe Factory. Bulmer was employed by Tukey Lumber and retired from Warren & Kincaid. They have two children, Gary and Nancy Bulmer and Vicky, who passed away in 2010, and her husband, Kenneth Taylor, of Smithfield. They have five special grandchildren and nine special great-grandchildren. The celebration was attended by 200 guests from Smithfield, Mercer, New Sharon, Oakland, Skowhegan, Norridgewock, Washburn, Augusta, Newport, Rome, Belgrade, Belfast and New Jersey, New York and New Hampshire. The Bulmers extend a special thanks to everyone who attended and helped with their celebration.